Formula 1 needs rule changes to make it less predictable, says Red Bull team principal Christian Horner. 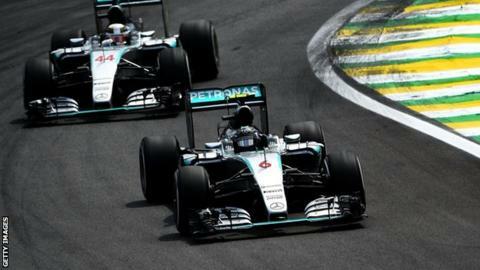 Lewis Hamilton has been crowned world champion for the last two years ahead of Mercedes team-mate Nico Rosberg. And Mercedes have dominated the constructors' title, winning 32 of 38 races and completing 23 one-twos. "The regulations are incredibly stable for next year, so Mercedes will inevitably carry on the dominance," Horner told Autosport. "People get turned off with predictability." He said it was up to the sport's senior officials to find a solution. Horner believes the current situation is different to when Red Bull dominated F1 between 2010 and 2013. Driver Sebastian Vettel was world champion for four straight years as Red Bull won four successive championships. "Two of our world championships went to the last race and we never finished first and second in a championship," said Horner.